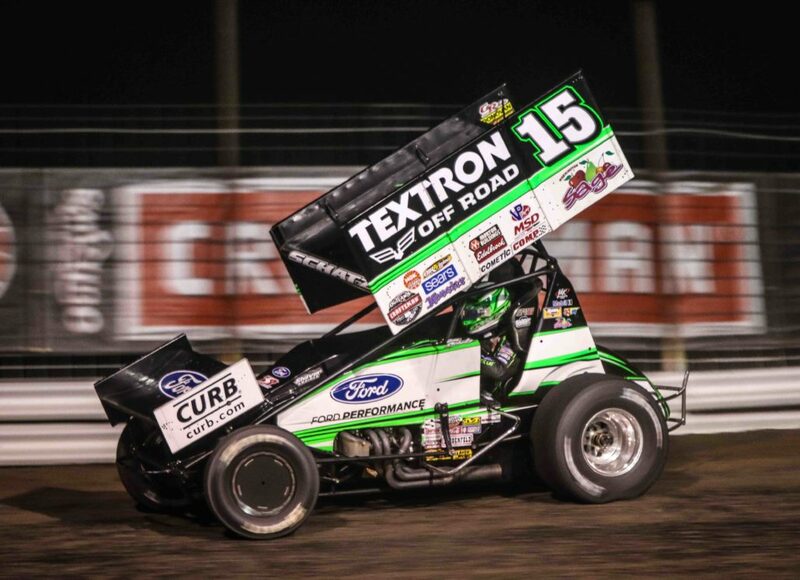 FARGO, N.D. (August 28, 2018) – Donny Schatz and the Tony Stewart Racing No. 15 team had two strong runs over the weekend. The nine-time and defending World of Outlaws Craftsman Sprint Car Series champion picked up a runner-up finish Friday at Black Hills Speedway in Rapid City, S.D. before finishing third on Saturday at Big Sky Speedway in Billings, Mont. Schatz’s series-leading 17 wins, 39 top fives, and 48 top 10s through the first 50 events of the season have helped him to a 236 point lead over Brad Sweet. The turning point for Schatz on Friday at Black Hills was a caution with 12 to go. The Fargo, N.D. driver took advantage of the double-file restart to move from ninth to second in two laps. Schatz set his sights on Sweet for the lead, but the Grass Valley, Calif. driver held on for the win. “Hats off to my guys, they always give me a good race car and we were pretty good at the end. I felt like we were running 43rd most of the race,” Schatz said with a smile. The team made the five-hour haul overnight to Billings for the second and final event of the weekend at Big Sky on Saturday. Schatz was fastest in time trials for the second time in as many weekends before going on to win his heat. Starting fourth on the grid for the 35-lap feature, Schatz quickly moved by David Gravel to claim third. Several cautions throughout the event set up double-file restarts, but Schatz was never able to capitalize to move by either Daryn Pittman or Jacob Allen. Schatz reeled in Allen amidst lapped traffic in the closing stages, but ran out of time as he took the checkers in third. “It’s fun to be in traffic, but that wasn’t in the cards tonight. Third is pretty respectable, the race track was fun and that’s all you can ask for as a racer,” said a pleased Schatz after the race. This coming weekend, the World of Outlaws will travel to the Pacific Northwest for four races in six days. The action kicks off on Friday, Aug. 31 and Saturday, Sept. 1 at Skagit Speedway in Alger, Wash. for the Outlaw Energy Showdown. In the two visits to Skagit last year, Schatz picked up fourth and fifth place finishes. On Monday, Sept. 3, the Greatest Show on Dirt makes a stop to Grays Harbor Raceway in Elma, Wash. before heading to Willamette Speedway in Lebanon, Ore. on Wednesday, Sept. 5.